1. Heat 1 tsp vegetable oil in a wide sauté pan. Add the beans and season. Fry for 5 minutes until vibrant green, but still crisp. Set aside on a plate. Turn the heat down to medium. 2. Add 2 tsp vegetable oil and the pack of diced butternut and sweet potato, and cook for 5 minutes, stirring often. Add the curry paste and coriander stems, and sizzle for 2 minutes until aromatic. Follow with the beans, coconut milk, 200ml water and half the tomatoes. Cover and simmer for 5-7 minutes, until the sweet potatoes, butternut and beans are just tender. 3. Roughly chop the coriander leaves and fold into the remaining tomatoes, then season. 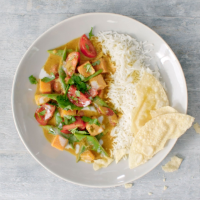 Drizzle the curry with the reserved coconut milk, and serve with the coriander and tomato relish, basmati rice and poppadoms.